The Kaiser Family Foundation has published a report this week outlining the major Medicare-related budgetary changes in the President’s budget for FY2016. Major key points of the budget included reductions to Medicare spending by $423 billion between 2016 and 2025. The summary provided by KFF below may serve as useful to home health policies and planning. .
More than one-third (34%) of the proposed Medicare savings are due to reductions in Medicare payments to providers, most of which affect providers of post-acute care (Figure 1). 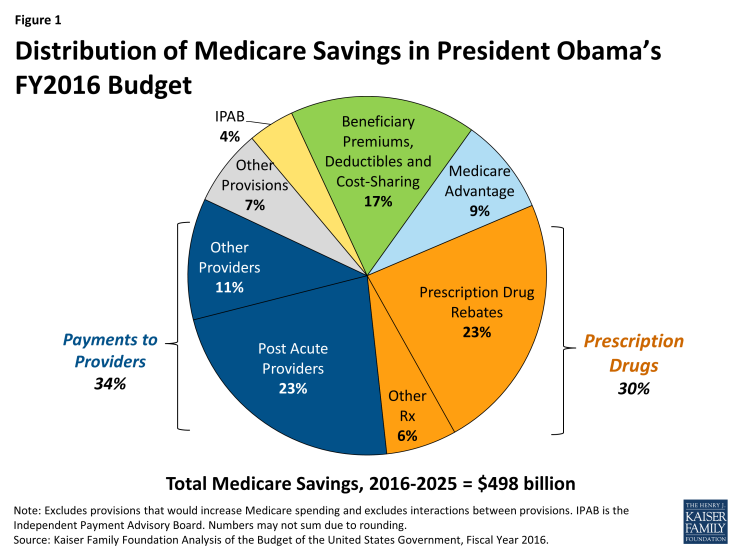 Nearly one-third (30%) of the proposed savings are related to Medicare prescription drug spending. The largest single-source of Medicare savings (23% of Medicare savings) is a provision that would require drug manufacturers to provide Medicaid rebates on prescriptions for Part D Low Income Subsidy enrollees, a proposal which was also included in the President’s FY2014 and FY2015 proposed budgets. About one-sixth (17%) of the proposed Medicare savings is due to increases in income-related premiums, increases in prescription drug copayments for low-income enrollees to encourage the use of generic drugs, an increase in the Part B deductible for new enrollees, and a new home health copayment for new enrollees. The President’s FY2016 budget would also repeal the Sustainable Growth Rate (SGR) formula and proposes about $54 billion in new Medicare spending, including, for example, provisions to reform physician payments and eliminate the 190-day lifetime limit on inpatient psychiatric care. Sequestration of Medicare Spending: Would replace sequestration with other savings and revenue provisions. Drug Price Negotiation*: Would allow the Secretary of HHS to negotiate prices for biologics and high-cost prescription drugs eligible for placement on the Part D specialty tier. Manufacturers would be required to supply HHS with all data and information necessary to come to an agreement on price. The final price would be indexed to the Consumer Price Index and plan sponsors would be permitted to negotiate additional discounts off this price. Estimated budget impact, FY2016-2025: less than $500 million. Income-Related Part B and Part D Premiums: Would increase the current law income-related premiums paid under Medicare Parts A and B, and expand the share of beneficiaries who would be subject to income-related premiums. Under current law, premiums for most people on Medicare equal 25 percent of projected average per capita Part B expenditures and 25.5 percent of average per capita Part D expenditures. Beneficiaries with higher incomes (more than $85,000 for individuals and $170,000 for married couples), including 5 percent of beneficiaries in 2014, are required to pay higher premiums, ranging from 35 percent to 80 percent of per capita costs (up to $336 per month for the Part B premium), depending on their income; these thresholds are fixed though 2019, and will be indexed to rise with inflation beginning in 2020. Dialysis Services*: Would expand Medicare coverage of short-term scheduled dialysis services for beneficiaries with acute kidney injury. Estimated budget impact, FY2016-2025: -$0.2 billion.